Make a real difference for women who are struggling to rebuild their lives here in the UK by donating today. The best way to support us is to give a regular gift which enables us to plan for the future. Can enable 10 women to attend our drama empowerment programme for a term. Drama sessions support women’s personal empowerment and wellbeing. The sessions focus on developing performance poetry which enables women to share their stories safely and creatively. 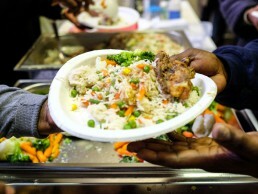 Can provide a warm lunch for over 100 refugee women. Beatrice (read her story below) cooks a nutritious lunch every week for the women who attend our drop-in. This lunch is a chance for women to build friendships, as well as a reliable meal for women who are living in extreme poverty. Can provide emergency support to a woman in extreme hardship. We provide small-scale grants to destitute women, to enable her to buy food or spend the night somewhere safe, for example. Can enable a woman to attend our drop-in English lessons. Attending these sessions is often the first step in a woman’s journey to empowerment. At our drop-in she will receive a warm welcome into a supportive community of women and develop the skills and confidence that she needs to challenge injustice and rebuild her life with dignity. You can make a single or monthly donation online using our secure BT MyDonate page. Women for Refugee Women, Tindlemanor, 52-54 Featherstone Street, London, EC1Y 8RT. Beatrice came to the UK to seek asylum in 2007, after being imprisoned in the Democratic Republic of the Congo because of her political activities. She had to leave her children, and her entire life, behind when she fled. Beatrice started to attend our free English classes and found a supportive community of women here. She spoke out in public about the struggles that women face when they are seeking asylum. After six long years, the Home Office granted Beatrice her refugee status. She was able to start rebuilding her life and started working at a cleaning company. In 2018, she finally managed to bring her children here; she hadn’t seen them for 11 years. Beatrice continues to give back to our community. Every Monday she cooks lunch for over 100 women who come to us for English classes. Donate to enable more women like Beatrice to rebuild their lives with dignity.